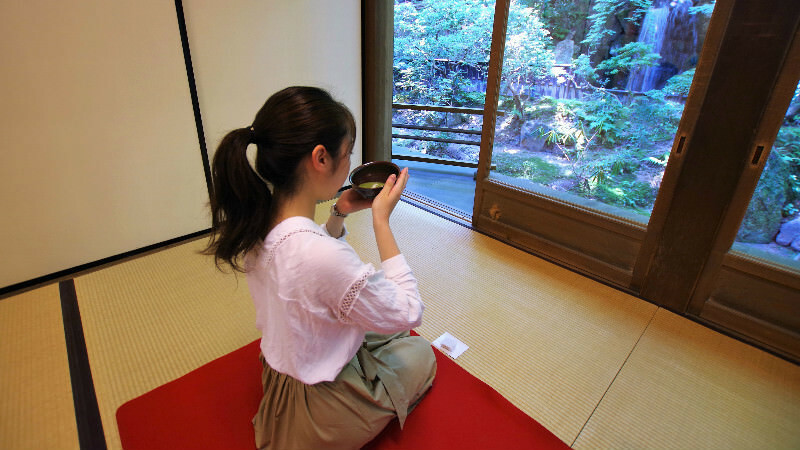 If you feel that a whole tea ceremony is a bit too much, the temples of Kyoto offer you a chance to enjoy matcha in a more relaxed yet also very traditional manner. 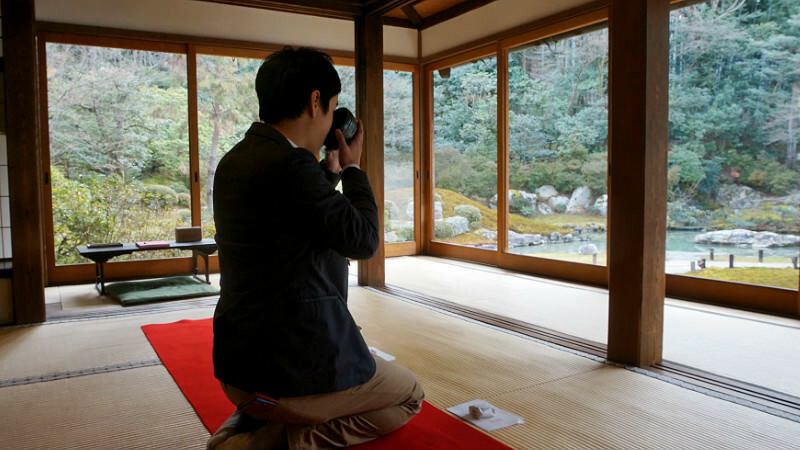 Most of the temples where you can drink matcha have a red carpet on the floor for you to sit on and also give you a traditional Japanese sweet to enjoy the matcha with. The correct tea ceremony way of enjoying this sweet would be to eat it before drinking your matcha, but at a temple, you can decide when to eat it. There are some temples in Kyoto where when you go buy an entrance ticket, you’re also offered the chance to buy a “matcha ticket” too, while others already include the price of matcha in the ticket price (like Hosen-in Temple). If you want to enjoy your matcha not in a temple but in a mountain villa, just head to Okochi Sanso Villa where you don’t only get matcha, you also get a postcard! This style of drinking tea in a more carefree manner is in Japanese called nodate, meaning just that the tea is enjoyed outside. Even if at the temple the tea is served inside a room or a hall, it’s usually served in this simple style of nodate. For you this means that you don’t really need to worry about how many times to rotate the cup before drinking; you can just concentrate on enjoying the tea and the great seasonal views. Hojo Garden is one of the gardens at Nanzen-ji Temple. It’s a rather big garden and it’s even a designated National Scenic Site. The temple building is also rather nice and big, not to mention the beautiful sliding door paintings, many of them made by the world-renowned Kano school of painting. The matcha ticket here is 500 yen (as is the entrance fee) and you can decide whether you want your matcha before or after seeing the temple. The tea room is on the right side of the reception, and as only those who have bought the tea ticket, it’s usually not that crowded. There is a small waterfall in front of the tea room, so not only do you get to a chance to sit down and enjoy matcha, you also get to enjoy a rather nice view. Hosen-in Temple is in Ohara, an area in northern Kyoto famed, besides the obvious temples, for its vegetables. The vegetables of Ohara are so delicious that many chefs of Michelin starred restaurants in central Kyoto make the trip to Ohara every morning to find fresh produce. The temple garden features a large pine tree that is said to be seven hundred years old. And not only is the tree old, it’s said to resemble Mt. Fuji. 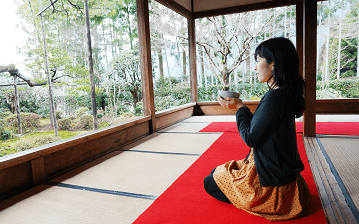 So by drinking matcha tea here at Hosen-in Temple, you not only get to enjoy a calm zen-like moment in northern Kyoto, you also get to enjoy a view of Mt. Fuji (well, almost). Shoren-in Temple is famous for both its relations with the imperial family of Japan but also of the great number of artworks it houses. You can see some incredibly beautiful sliding door paintings by Hideki Kimura, an artist known for his unique style of painting which he describes as “Kyoto rock ’n’ roll”. You can also have a cup of matcha at this temple. The entrance fee is 500 yen, and the matcha is again 500 yen, which is the usual price for temple-matcha in Kyoto. The view of the garden is good and both the room you’re in and the garden feel very spacious. So, to sum everything up, drinking tea at a temple is a relaxing activity which lets you take a break and sit down, and just forget about your busy temple-hopping itinerary for the moment.